Always wanted to party on a bus through the city of Joburg? Now is your chance! Our party bus in Johannesburg is the place to be when you want to up the fun and start your evening off with a bang you won’t soon forget! If you want to throw a party that everyone wants to be part of, our party bus for hire is just what you need. Kitted out with everything needed to turn a bus into the hippest nightclub on 4 wheels, you will have access to a bar, LCD TV, and a theatre sound system, all accompanied by LED roof lighting. Our party bus easily accommodates 18 people. Party buses come in a whole lot of shapes and sizes. Ours is the perfect size to accommodate groups headed to rugby matches or to make a bachelor’s party or birthday party really exciting. But parties are not the only excuse you need when you want to have a good time. Our limos and party bus in Johannesburg can be used for other events as well, such as your normal weekend night out, corporate functions, trips to Sun City or to a day spa, concerts, and we even do airport transfers. Please click here to find out more about our Johannesburg party bus prices. 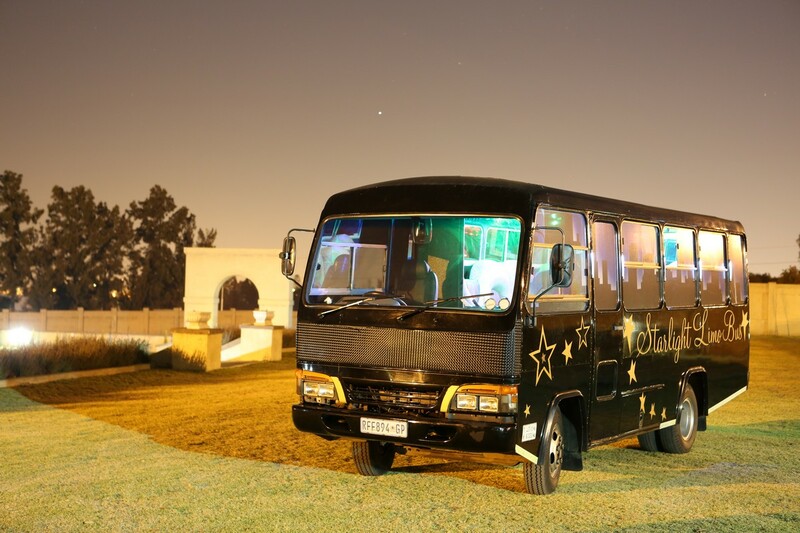 With our party bus for hire in Johannesburg, a fun-filled journey awaits. And this is an especially fantastic option to go with when your group will be travelling longer distances than usual. Having a chauffeur to get you from A to B allows you to sit back and enjoy the ride. Our chauffeurs are some of the best in the business. As certified, professional drivers, you will be in safe hands. The route can be tailor-made according to your travel destination, which makes our party bus the perfect way to show off the beautiful City of Gold. Whether you are entertaining friends or looking to take business associates to the city in a way they have never seen it before, the party bus will safely cater to your needs. With the LCD screens, the party bus is also fantastic for all kinds of corporate functions and team building, with presentations easily displayed. Drinks and snacks make the party bus a boardroom on the move. Why hire our party bus in Johannesburg? Other than the fact that our party bus hire is really well priced, we are also a well-established company with a great reputation for luxury service. At the moment, our bus is available for hire in Midrand, Midstream, Bedfordview, Roodepoort, Alberton and Sandton, but we also soon be offering our services to guests in Pretoria. A party bus is a more exciting, more modern version of the limousine. With a bar, awesome lighting and really comfortable seating, this is one ride you won’t regret. To find out more about our party bus hire in Johannesburg or to book one of our limousines, contact us.